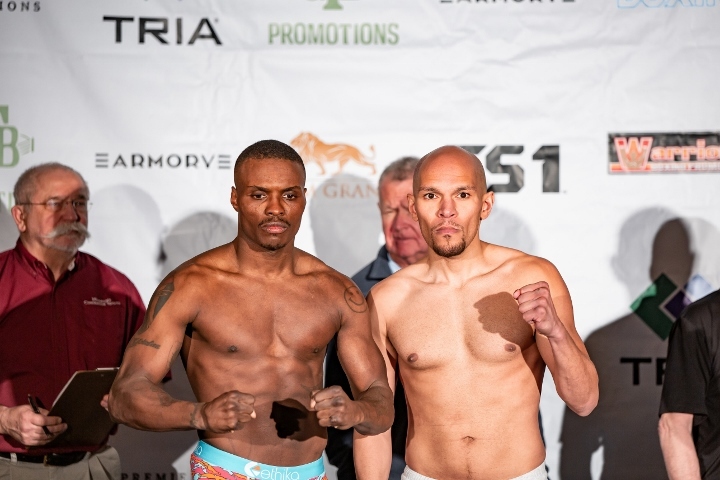 It was the perfect start for Peter Quillin in Saturday’s super middleweight IBF title eliminator against Caleb Truax at the Armory in Minneapolis. For two rounds, Quillin landed crisp jabs and timely counter punches. The fighter known as “Kid Chocolate” won both rounds on the scorecards. But the third round never came. Quillin’s quest for a second division title hit a snag when he collided with Truax midway in the second round. The two former champions had a clash of heads, with Truax taking the bulk of the damage. Blood gushed out of a deep cut over Truax’s right eye, forcing the ringside doctor to stop the fight. The PBC on FS1 main event left fight fans in Minneapolis disappointed and sent the two boxers home with a no decision on their resumes. A sold-out crowd of 4,117 came out to see their hometown fighter Truax. Quillin wants to return to Minneapolis for a rematch or have the second meeting in his hometown of Brooklyn, New York. "I want to do it again with Truax here in Minnesota or come back to Brooklyn, my home," Quillin said. "Let him get stitched up. Me and my trainer will be back in the gym on Monday. We didn't get the sweat in, we didn't get to do anything tonight. We'll be back in the gym Monday and be dedicated and will wait for the phone to ring." Truax’s cut didn’t compare to the gruesome gash Badou Jack sustained in January against Marcus Browne, but the blood coming down the eye of the Minnesota native was a concern for the doctor, who allowed the second round to finish before stopping the bout. "First of all, I think the doctor's job is to make sure the fighter is safe," Quillin said. "That's number one. People would rather see him fight without an eye, but I'd rather have the guy be able to fight another day." All this happened in front of IBF super middleweight champion Caleb Plant, who was hoping to get a close up look at potential opponents. Now it’s unlikely that Plant will face Quillin or Truax in the near future. Plant won the title in January after defeating Jose Uzcategui by unanimous decision. Good idea, let it be the undercard on a regular FOX show.